In contrast to most commodities, the prices of which have tumbled in the past few years due mainly to oversupply, the price of market pulp has continued strong enough to encourage companies in Brazil to make a start on four new pulp lines. With the world price of most of the commodities exported by Brazil far below their highs of recent year, with the country’s economy teetering on the verge of recession and likely to shrink by up to 2% this year, there is little favourable news at the moment. One exception to the gloom, however, is market pulp. The four leading companies in Brazil, Fibria, Suzano, Klabin and Eldorado, whose mills already make about 15mt (million tonnes) of pulp each year, have made a start on building new lines which will add an additional 6.5mt to total output by about 2020. Pulp exports will increase from the 10mt of 2014, to 15mt by 2020. Little of the extra will be needed in Brazil, where demand for most grades of paper grows only slowly. Hundreds of thousands of the farmers who grow soya responded to several years of high prices by planting more, while the record price of iron ore attracted numerous new mining companies. Things are very different in the pulp industry, which is dominated by a small number of large companies. Even though they are nominally competitors, the firms all work together to ensure that only one new mill starts up each year, so no excess of pulp causes prices to plummet. The latest generation of mills are each able to make close to 2mt a year and cost about $2 billion to build. A similar amount is needed to plant the thousands of hectares of forest needed to supply the mills. A go-ahead to build a new mill is only given once the company concerned is confident that a market for the new output will be there. World demand for pulp continues to grow slightly faster than the global population. This is mainly because the tens of millions of people who migrate each year from the countryside to cities in numerous countries around the world, notably in China, other countries in Asia, in Africa and other developing countries use far more paper than those in living the countryside. In addition, several high cost mills mainly in Europe or the United States close down each year, leaving space for the lower- cost pulp made at Brazilian mills. Fibria claims it will cost less than $160 to make each tonne of pulp at its new mill, the lowest price in the world. This is because of economies of scale and also because far less manpower, getting more expensive year by year, is needed to run the latest mills. The adoption of new cloned varieties of eucalyptus and pine means that productivity in forests has been growing fast as well in recent years. Less land is needed to produce each tonne of wood than before, so less capital is needed to buy or rent land. In the past, the full cycle of a plantation of eucalyptus lasted about 24 years, and trees were allowed to sprout twice after the first cut. But the latest varieties are cut after just six years, with the new trees producing much more than their predecessors, The giant Klabin company is the leader in packaging materials in Brazil, notably of the packaging first used to package drinks such as orange juice and soft drinks, but which is now used to hold fruit and vegetables, notably tomato products. This has replaced glass and cans. Klabin was the first to start work on its 1.5mt-capacity mill, which will make two types of pulp. Long fibre pulp is more suitable for making the robust type of corrugated paper used to make packaging, as well as for various types of board, so Klabin has always used a blend of both long and short fibre pulp to make its paper. A hundred per cent of short fibre eucalyptus pulp is by the other companies, being used to make printing and writing, tissue, and most other types. Brazil’s pulp industry was hit hard by problems caused by poor investment decisions made prior to the 2008 financial crisis. The crisis bankrupted Aracruz, forcing it to merge with VCP. VCPwasthepulparmofcommoditygiantVotorantim, also strong in cement, and in aluminium and other metals. Fibria was the result. With its debts now manageable, Fibria is soon to start work on a new line at the company’s 1.7mt-capacity Tres Lagoas plant, located alongside the Parana river in Mato Grosso do Sul state. This mill, together with a newer one close by owned by the Eldorado company, is much further from most of Brazil’s large cities or from ports, than the earlier generation of mills belonging to Aracruz, Votorantim, Klabin, Suzano and numerous smaller companies. All of these were built close to the coast, to be within easy reach of ports such as Portocel, Santos and in Klabin’s case, Paranagua. Rail links allow the companies to transport the pulp to their own terminals at port in specially built rail wagons. A 1,000km rail line also links both Fibria’s mill, as well as that of more recently built Eldorado company, to Santos. Eldorado is controlled, and mainly owned by the world’s largest meat producing company, JBS. Eldorado’s mill, started up in late 2013, is now the largest in Brazil, and made close to 2mt in 2014. The company will soon make a start on a new line at its Mato Grosso do Sul mill. So far, Eldorado has been far less cautious than its longer-established peers as far as building new mills is concerned. Eldorado also seems to be more confident than the giant Suzano company, which has recently started up the first very large mill in Brazil’s the north east. Suzano’s new mill is also located alongside a railway which links with the line which takes Vale’s ore from its Carajas mine to the port of Itaqui. The mill was planned to be the first of two, but Suzano has now decided to delay making a start on second plant in Maranhao state for the time being. In addition to the new mills to be built by Klabin, Fibria and Eldorado, CMPC is also pushing up production at its mill in Rio Grande do Sul state. Brazil’s National Development Bank, the BNDES, has always provided much of the finance needed to build virtually all the new mills, as well as for planting the forests needed to provide the wood needed. Soon after it was formed in the 1960s, the BNDES set about identifying industries which experts considered could be competitive on a world scale. One of the first to be pin-pointed was pulp and paper, as well as steel. More recently the meat industry followed suit. While Brazil has long been a world leader in pulp, until recently the country’s very fragmented beef industry lagged behind that in neighbouring Argentina as well as much smaller Uruguay on the world stage. This all changed a decade ago, when the aggressive Batista brothers formed the JBS company. With Development Bank help, JBS set about buying up numerous other beef processors facing financial difficulties. The first of these was in Brazil, but soon after JBS began buying meat packers in Brazil’s two southern cone neighbours, Argentina and Uruguay, both which had traditionally exported far more beef exporters than Brazil itself. Taking advantage of the fact that the Brazilian currency, the real, was relatively strong at the time. JBS bought numerous large and well known firms which were in difficulties further afield, first in the United States, to be followed by companies in Australia, Asian countries, and even some in Europe. Low-cost BNDES funding has been instrumental in allowing JBS to emerge as the world’s leading meat processor, as it now handles pork and poultry, as well as beef. Partly because it was able to take advantage of exchange rate fluctuations, JBS became very profitable in the process. Looking for new fields in which to operate, and encouraged by the BNDES to join the ranks of the then troubled pulp industry, JBS turned to pulp. Even though it had no previous experience in the industry, JBS’s Eldorado 2mt giant, is the largest mill in Brazil. Fibria sells much of the pulp it makes at Tres Lagoas, to the neighbouring International Paper company, which bought a paper mill which VCP had built before the newly formed Fibria company decided cease making less profitable paper and concentrate on pulp. Unlike its more cautious peers in the pulp industry, JBS has never been worried about borrowing huge amounts, both to finance its take overs of meat packers, and to build the Eldorado mill. But in the present rather delicate financial climate, private investors, which are quite happy to lend large amounts to Fibria, Klabin and Suzano, have steered clear of the more brash, although apparently equally successful, Eldorado. This company sometimes cuts corners and has rather blotted its copybook by planting cloned stock developed by and patented by Fibria for planting in its own forests. Eldorado was obliged to pay large fines to Fibria following legal action. Aracruz,VCP and Suzano were all originally family owned companies and although the BNDES often pushed them to merge in order to achieve economies of scale, their founders refused to accept the idea. But the financial crisis of 2008 which rocked Aracruz and forced its merger with VCP, together with the disappearance of their original founders, has made the idea of their mergers more acceptable to the industry’s current present professional managers. Executives at Fibria have made no secret of favouring a merger with Suzano, perhaps subsequently one with Eldorado as well. Basking in the apparent strength of their meat trading business, which is spread across five continents, and seemingly little affected by the prolonged financial crisis in many markets Eldorado, has so far turned up nose at such a plan. But with a downturn in the price of the beef and now chicken and pork which are still responsible for the lions share of the company’s profits, and with the Development Bank under pressure to be more transparent in its operations, who can be certain of what the future may hold? The emergence of one huge pulp producing company in Brazil is quite likely in the medium term. On its own, Fibria will soon be making almost 8mt of pulp. The short fibre pulp which forms the majority of what is made in Brazil, is particularly suitable for making tissue, used both to make sanitary and also paper towels. But until now, only small quantities of ‘fluff’ pulp, used to make nappies, as well as items for women’s sanitary needs and the incontinent has been made in Brazil, so most of the 400,000 tonnes used each year, has been imported. After a year when it was halted, and when the Orsa packaging materials company was taken over by International Paper, the pioneering Jari mill deep in the Amazon jungle, was re- started early this year. 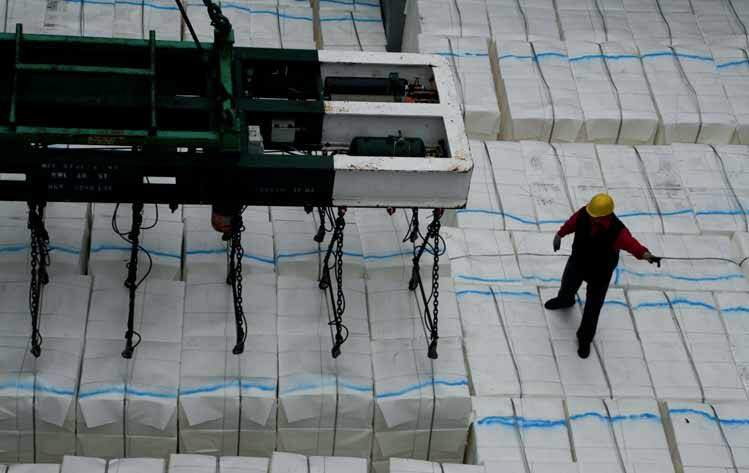 Jari is scheduled to make some 220,000 tonnes of soluble pulp in a full year, rather than the 400,000 tonnes of market pulp made from a variety of woods, which it did previously. After experimenting with several exotic types of wood, notably the African Gmelina, Jari has now settled for eucalyptus as the most appropriate one. Producers, Bracelpa, in the lead, but also including the makers of MDF, and particle board, have merged to form one large forestry entity. Brazil now boasts about 14 million hectares of planted forest, and with demand booming in all sectors, the industry anticipates the area increasing to 20 million hectares in the next few years. By then twice as much MDF and Particle board, as well as other panel products, is expected to be needed. Most will be used by the booming furniture industry for sale in Brazil. SENNEBOGEN has brought the latest generation of the 723 to market with compact dimensions, a sophisticated machine concept and numerous equipment variants. The mobile timber handling machine offers a tailor-made solution above all for smaller saw mills and timber processing companies for efficient timber handling. For decades, the reliable timber handling machines of the Bavarian manufacturer SENNEBOGEN have proven themselves to be ideal in demanding practical use. With the new edition of the 723 of the current E-Series, SENNEBOGEN brings a machine with 27-tonne deadweight to market, with especially impressive compact dimensions and maximum stability in demanding timber handling. Equipped with a diesel engine complying with the Tier 4f emissions standard, a newly designed robust mobile undercarriage, and particularly low consumption values, the new material handler is made to impress. As a mobile timber handling machine, the SENNEBOGEN 723 is at home in the saw mill and in the log sorting yard. The drive is provided by a 119kW strong diesel engine. With a two-stage all-wheel travel drive and 11m equipment length, the machine also offers smaller companies the best possibilities for optimizing their timber handling processes. After the successful market launch of the larger SENNEBOGEN 735 in 2014, the second type of this machine generation will be available via the worldwide network of SENNEBOGEN sales partners starting in autumn 2015. Special attention was paid to the safety features of the machine during design and development. A newly designed access ladder, in combination with the peripheral uppercarriage railing and the extensive step grids, ensures maximum work safety. A massive, full protective grating is installed on the cab as a standard feature and can be supplemented with an armoured glass pane. An extensive travel drive protection on the undercarriage is optionally available. Thanks to compact dimensions of 3m in width and a rear radius of 2.52m, the machine can even move safely into narrow alleys. Thus logs can be conveniently manipulated to a height of approximately 10m. Thanks to the 360° infinitely rotating uppercarriage, the machine can always be moved out forwards again, eliminating the need for complex manoeuvring. This also makes it significantly easier to unload trucks. The new SENNEBOGEN 723 is optimally equipped for use on demanding terrain, inclines and difficult substrates. The two powerful travel drives with two speed levels accelerate the machine up to 20km/h. With wide twin tyres and a supplemental support plate, the machine is stable in every position. The proven, roomy Maxcab comfort cab is used in this machine class for the first time. For the operator, the 1m rigidly elevated cab offers an ideal overview of the equipment and work area. An extensive lighting package and peripheral cameras offer the operator additional support during work. Equipment features, such as the standard direction of travel reversal and the SENCON control system with intuitive operation, ensure fatigue-free and comfortable working. A well-though-out maintenance concept offers optimum access to the components and simplifies daily maintenance. Beumer fillpac® for the building industry? Cement, mortar or gypsum — the bulk density, flow characteristics and grain distribution of these products, which are filled in bags and packed for delivery to the customer, may vary significantly. BEUMER Group, a single-source provider of filling, palletizing and packaging systems offers the BEUMER fillpac®, which can be flexibly integrated and adapted with existing packaging lines by the user. Depending on project requirements, BEUMER Group offers varying designs. Specific weighing electronics are utilized to ensure weight accuracy of the bags. Operators can nearly eliminate rejects caused by too high or too low filling weights. Building materials have their own specific characteristics, such as high product temperatures or different volumes and weights — they may show an unusual flow behaviour and may be dimensionally unstable. As a partner to this industry, BEUMER Group successfully enable material manufacturers to fill bags without any product loss with the BEUMER fillpac®, an efficient filling machine. The systems of this construction series fill reliably, carefully and sustainably while meeting the required throughput. The BEUMER fillpac® is equipped with a weighing unit, which communicates permanently with the filler neck via a dedicated software. The automatic bag weight control determines the exact filling weight while filling. This way the system always achieves accurate degrees of filling. Thus the packaging line works more efficiently as it is no longer necessary to remove under or overweight bags from the material flow. In addition, the quantity indicated on the bag always corresponds to the real volume. Depending on the requirements and on the material characteristics such as bulk density, flow behaviour or grain distribution, BEUMER Group can offer both air and turbine filling machines from the construction series. The air filling machines are suitable for bagging pourable and coarse-grained products with particle sizes up to ten millimetres. The systems use a blower to fluidize the materials in a pressure chamber. The products can then be filled into bags gently and precisely. Depending on the throughput, the user may opt for a rotary or an inline filling machine. The air rotary filling machines have four to twelve filling modules which are arranged in a circular pattern. Depending on the number of filling spouts, the systems reach a maximum capacity of 1,200 to 3,600 bags per hour for 25kg bags. The air inline filling machines are generally equipped with one to four filling modules. Depending on the number of filling spouts positioned next to each other, the system achieves a capacity reaching between 300 and 1,200 25kg bags per hour. Regardless of whether the system is arranged in a circular pattern or in a line, capacity and utilization can be improved by installing an optional automatic bag placer. The filling process is carried out either automatically or at the push of a button. Two configurations are available for removing the bag at the end of the filling process: either manually or automatically with vertical bag discharge on a belt conveyor. The turbine process is the appropriate solution for companies which predominantly fill free flowing and fine-grained materials, such as cement or gypsum. The turbine filling machines use motor-driven impellers. They can be arranged either horizontally or vertically, ensuring a particularly high filling pressure and thus a very good compaction of the fine-grained materials to be bagged. The result is filled bags which are compact and dimensionally stable so that the user is no longer required to vent them. With up to 20 filling modules, the BEUMER fillpac® R for example can fill up to 300 tonnes of fine-grain materials per hour into diverse bag types. The HDPE bag placer, an exclusive offering of BEUMER Group, enables dependable filling of HDPE bags. The filling impeller is characterized by its speed and the maximum material throughput. The bag weight adjustment, which automatically adjusts the weight of the next bag, always ensures precise results. Opening and closing of the vertically mounted filling spout is carried out outside of the dirty area — this way the three- position cylinder which regulates the coarse and fine flow is protected from dust. The cylinder for bag discharging is also located in the dust-free zone above the filling spout.This solution minimizes wear and tear on both cylinders and, therefore, ensures longer service life. The BEUMER construction series is equipped with an ergonomic control terminal. The improved Human–Machine Interface concept allows operators to work in a simple and intuitive way. Almost all built-in components of the BEUMER fillpac® are freely available commercially. This reduces delivery times for spare parts and lowers capital costs for the user. Furthermore, the intralogistics supplier has designed the system in a way that individual customer requirements or special operational requests can be implemented flexibly and cost-effectively.